Yeah, I know. We should have known better. 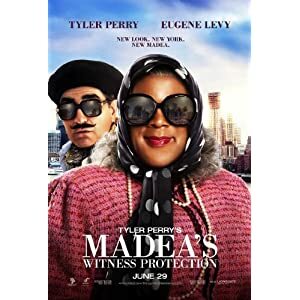 Tyler Perry’s Madea’s Witness Protection Program is a big, dumb mess of a movie. The worst of an admittedly (wildly) uneven film series. You know you are in trouble (big trouble!) when Denise Richards (!) is doing the best acting work of anyone in the ensemble. I have never seen a worse performance than Eugene Levy’s mugging, unfunny tomfoolery in this thing, and my heart hurt that Doris Roberts and John Amos were anywhere near this film. As always, Perry is a warm-hearted, saucy delight as the title character, and he is even better-than-adequate as Uncle Joe and as Madea’s nephew. However, the man cannot write a decent script to save his soul…and his directing is just a notch above ABC After-School Special territory. The highlight for me was watching Madea, a character who apparently hasn’t flown post-9/11 (if ever), navigate the absurdity that is modern air-travel. Watching her take off her shoes in the inspection line was (almost) worth the price of admission. Almost. Avoid at all costs…even when it airs on TNT in what will feel like three weeks.